A capriccio is a piece of music usually fairly free in form and of a lively character. The typical capriccio is one that is fast, intense, and often virtuosic in nature. 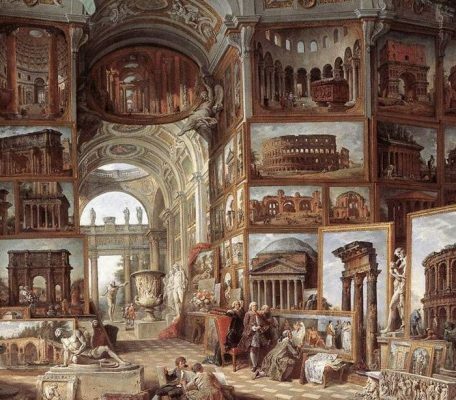 In paintings, a capriccio means especially an architectural fantasy, placing together buildings, archaeological remains and other architectural elements in fictional and often fantastical combinations, perhaps with staffage of figures. It fits under the more general term of landscape painting. It may also be used of other types of work with an element of fantasy. For this Capriccio for wind orchestra I was freely inspired by “Capriccio of Rome” (picture above), painted by Pannini in 1758. The world first performance took place (November 2015) also in Luxembourg by the European Youth Wind Orchestra conducted by Jan Cober. For hiring possibilities please fill in the → contact form.